Everywhere I turned in the Netherlands, I found one more example of how a bike really can be the only vehicle a person needs. I guess this guy's wife had no problem saying, "Honey, drop the girlS (yes, plural) off at school on your way to work today, please!" So everyone climbed on and away they went..... as I stood there, in utter amazement, trying to focus my iPhone fast enough to snap a pic! That is amazing! Biking really is a great way to get around and save the planet at the same time. 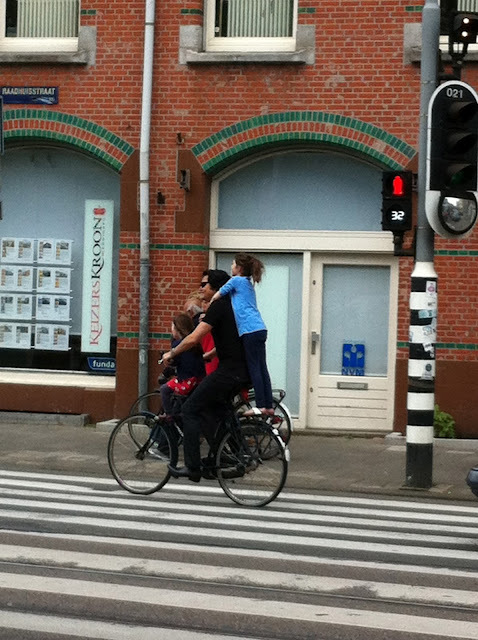 It's true, those Dutch LOVE their bicycles! I remember when I went for a long weekend to Amsterdam, at the local, big supermarkets, the 'parking lot' consisted of maybe five parking spots for cars, then just long rows of bike racks! So funny! - Wish I would be better about biking.. workin on it..
At least everything is FLAT there. Makes it a bit easier. Reminds me of how we have men piles up and squished in the backs of trucks here all the time. And kids with no car seats. I've seen a lot of strange biking scenarios in Europe so far, but this one takes the cake! Great job on capturing the photo too btw!